just got kung fu’d by some tofu … and i liked it! 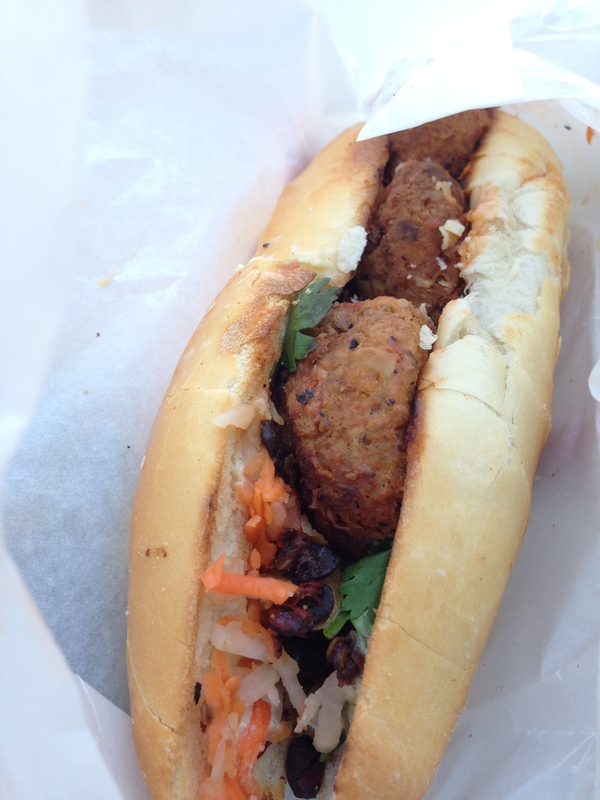 Up close with the tofu “meat”-ball banh mi. First and foremost, the bread was perfect. Absolutely perfect. A nice crunch on the outside and soft inside – and I believe they may have torn out some of the excess to preserve excellent bread:filling ratio. As for the filling, those pickled carrots are amazing, and the “spicy beans” are an absolute must – to omit them would be to miss out on a very important contributor of flavor. Now, for the tofu-ball, I have to say that it was pretty darn good. Do I wish it was something more porky? Sure – but it was nevertheless well-seasoned and had a firm enough texture to stand up to a few bites before disintegrating. All in all, this sandwich totally rocked my socks. I was not expecting such a showing for $5.50. I’d go back there in a heartbeat for the tofu sandwich (and I’d pay $2 if they’d give me some pig). a says: My unpictured tofu “beef” had great flavor and freshness, but the only issue was slightly soggy bun and chili paste was less hot than usual. t says: vendors take note: no one likes a soggy bun. Boy am I glad I ate mine right away and didn’t wait ’til later – it’s the only way to avoid bun sog.